Generally I only find out about Nation [insert-delicious-treat-here] Day at the end of it, as I sit down to read through the day’s blog posts and I see that everyone else commemorated it with a delicious dessert and mouthwatering pictures. 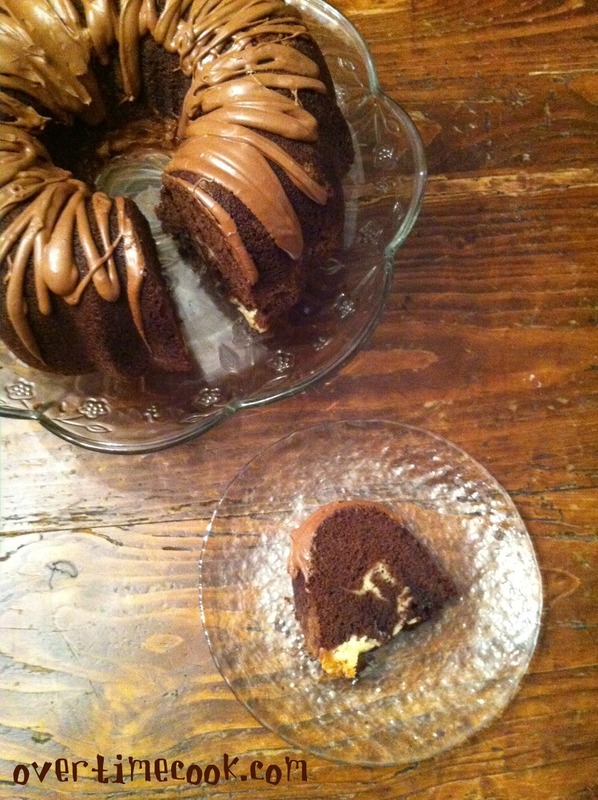 Luckily, that won’t be the case for my favorite dessert in the world: National Bundt Cake Day. Strictly speaking, bundt cakes may not be my favorite all-time dessert, but they sure are my favorite to make: minimal design, gorgeous looks…what’s not to love? Back to this most glorious of all national holidays. The banks and the postal service may not be closed, but thanks to The Food Librarian and her month-long bundt campaign, I knew about this day well in advance, and had a chance to bake this gorgeous cake. This bundt cake had been formulating itself in my mind over the last couple of months, and I was thrilled to finally have a good excuse to try it. In honor of National Bundt Cake Day, I decided to add a nice little cheesecake swirl. If you aren’t so inclined, skip it. The cake is moist and delicious enough without it. If you want to go for the wow factor, definitely include the cream cheese swirl. Yep, speechlessness. Yep, this cake is really good. After the initial period of speechless awe, the reactions ranged from “wow” to “can I have another piece” to “I really need to get this recipe.” No, I don’t think my office is hiring at the moment. Sorry folks. Preheat oven to 350. Grease a bundt pan well with Baking Pam (baking spray with flour). Set aside. Cream cheese mixture: In a large mixing bowl, beat the cream cheese, sugar, vanilla and egg until well combined and creamy. Set aside. Cake batter: In a large mixing bowl, beat together the margarine or butter and sugar until well combined. Add the vanilla and eggs, one at a time, beating well after each addition. Scrape down the bottom of the bowl with a rubber spatula, as necessary, to incorporate everything. Beat in the chocolate pudding mix until well combined. The batter will look like a light chocolate batter at this point. In a separate bowl, combine the flour, cocoa powder, baking powder and salt. Whisk to combine. Pour the dry ingredients into the mixing bowl, alternating with the milk until all the ingredients are mixed in. Scrape down the sides of the bowl with a rubber spatula to ensure everything is mixed together, but don’t over-mix. The batter will be quite thick at this point. Pour half of the cake batter into the prepared bundt pan. Smooth it out with a rubber spatula. Pour the cream cheese mixture over the batter in the pan. Spread the remaining cake batter over the cream cheese mixture in the pan. It may be hard to smooth it out, but try to cover the cream cheese with cake batter. If a little bit shows through, that’s fine. No need to swirl the cake, the baking powder will do that for you! Bake the cake at 350 for about 50 minutes, or until a cake tester comes up with cream cheese filling, but no raw chocolate. Set aside to cool. For topping: in a medium bowl, whisk together the powdered sugar and cocoa powder. Add the milk, one Tablespoon at a time, until the mixture reaches the desired consistency. Pour over cooled cake. And of course, enjoy! For non-dairy, make the following substitutions: (I made the cake this way, and it was absolutely delicious!) Substitute tofutti cream cheese for regular, margarine for butter, and Rich Whip (aka Cool Whip or Parve Whip) for milk in the cake and the frosting. If you don’t want to go to the extra trouble of making the cream cheese mixture or the topping, the cake is delicious without! The frosting makes quite a bit, so you might be better off making half the amount if you don’t like a heavily frosted cake. Thanks folks for stopping by! And thanks for celebrating this delicious day with me. 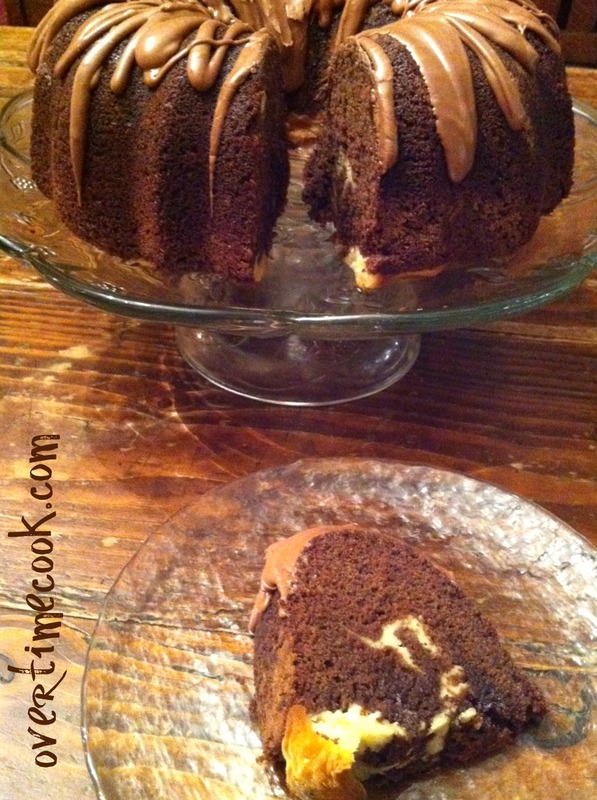 This sounds like a great bundt cake – I love the cream cheese filling and the chocolate drizzle! 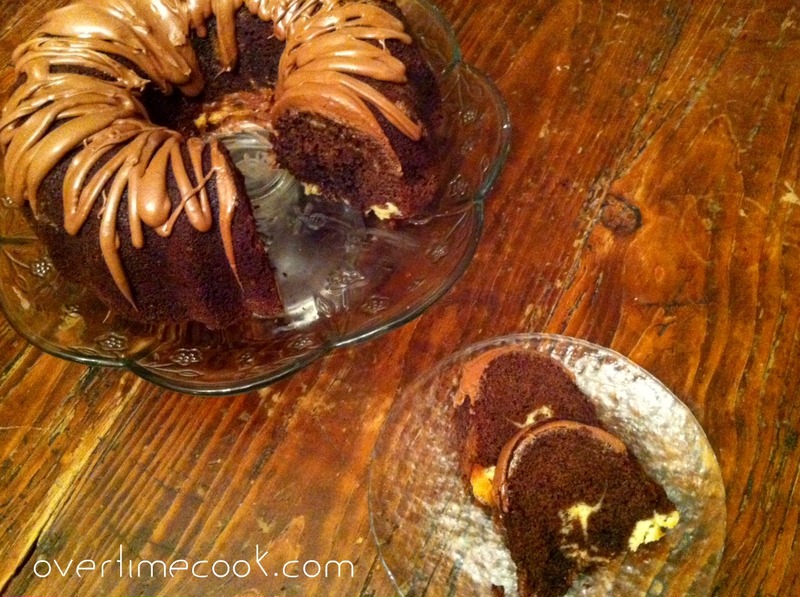 One of my favorite cakes is a bundt – rum cake. As one who tried a piece, I can tell you that this cake is awesome! Looks stunning and tastes even better. Thank you, Miriam. . I am pretty sure the first reaction was speechlessness because they had cake stuffed into their mouths. Looks terrific! Just got my first bundt pan as a gift, and this would be the perfect reason to try it out. Any tricks to getting the frosting on? No real tricks, just drizzle with a spoon and make sure it doesn’t come off the spoon too thick. Also, rather a little thick than a little thin, so add the milk slowly and don’t add too much. Not only does this kinda have me wishing (for today) that I wasn’t retired and that I worked in your office but I guess that would be pointless as your co-workers most likely ate every last crumb of this gorgeous bundt yesterday! Next time you make this, please give me a piece! This cake is SO good! I made it when you posted the recipe and froze it, and just took it out this weekend. I was already gaining weight with all your other recipes that I’ve been trying, but this cake is dangerous. did you freeze it with the glaze? I didn’t. I’m not sure how the glaze would freeze. Shaindy, it’s always best to glaze a cake last minute. You’re probably better off storing it in the fridge, but I think if you can’t it should be fine. Thanks so much. I will keep it in the fridge. I just tasted it and it’s delicious! Should the chocolate pudding mix be instant or regular? Either should work. I use instant. Thank you for your help. The cake came out delicious. I love the glaze and plan on using it for other recipes but it came out much darker than yours. I was wondering what type of cocoa you use? Super fan here..;) not sure what rich whip is here in Aussie or if we even have it. Could I just use soy milk? And now I need to stop reading ur recipes..there’s no room left in my freezer!! I can’t just sub the milk with soy milk? Didn’t get a reply to my comment-is soy milk ok?